The all conquering Military Wives Choir Christmas Number 1, ‘Wherever You Are’, could well provide the stepping stone for a new brass band test piece, according to the man who composed it. Speaking exclusively to 4BR, Dr Paul Mealor revealed that he would love to write a new work for a major brass band contest—if he has the time, thanks to the unprecedented success of the charity single which sold close to 600,000 copies to claim the coveted Christmas top slot. "I think it would be a great," he told 4BR. "I’m very proud of my brass banding background having played with Northop Band on euphonium for a number of years, and I have composed works for the medium before." 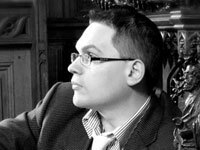 Paul, who has been the Reader in Composition at The University of Aberdeen since 2000, shot to international fame earlier this year when he composed the beautiful ‘Ubi Caritus’ for the wedding service of the Prince William and Kate Middleton at Westminster Abbey. After working with conductor Gareth Malone on previous projects, he was asked to composer the music for the Military Wives Choir using words from the hundreds of letters, prayers and poems sent by families to serving soldiers. "It has been a great honour—a very powerful and emotional privilege. Amazingly, it was the very first letter I read that provided the title –‘Wherever You Are’—it just struck a huge chord in so many ways." Now, he is inundated with requests for interviews, projects and compositions, but feels he may just have the time to return to brass bands. "I’m a keen follower—especially on 4BR, so I still keep up to date with what’s going on. A few years ago I wrote a ‘Baritone Concerto’ for Carole Crompton and a 12 minute composition entitled ‘Rhapsody on a Theme of Purcell’ for the Welsh Brass Arts Festival run by Craig Roberts." He added: "I would love to write a major work for one of the really big contests—if I can now find the time, and of course be asked. It would a great honour, especially as it would mean following in the footsteps of my teacher and great friend Dr John Pickard." In the mean time Paul is fending off a multitude of requests for interviews from all over the world, before starting back to work and putting the finishing touches to a new work for Scottish Opera. "At the moment it’s all so hectic, so to get back to composing will be a bit of a relief," he added. Meanwhile, Paul confirmed that an official brass band arrnagement of the single will be published in the near future. "Everyone is aware how popular the single has become, so an official arrangement by Duncan Stubbs will be published for brass bands by Novello in the very near future."